Here's the top view of the thing. I was surprised to find that I could mount the VFO inside the case, next to the low pass filter without trouble. I power it via a 7808 regulator to allow for battery sag and I have boxed it in double sided copper-clad board to screen it. 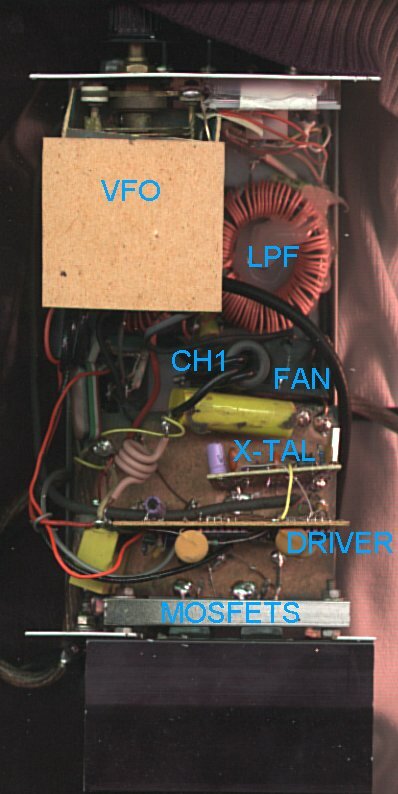 You can see the vertically mounted veroboard with the CMOS chips and the driver chip on it next to the output FETs. This version of the rig keys the driver chip so there are no high current keying circuits to worry about. The little coil of pink wire forms the meter shunt.